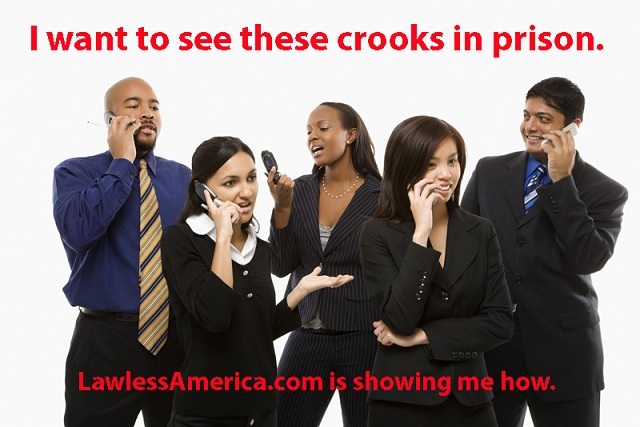 Now that we have presented undeniable evidence of nationwide corruption to every member of the U.S. House and U.S. Senate, the next phase in the Lawless America Revolution is to file criminal charges against the corrupt government officials, judges, attorneys, perjurors, and others in our cases. We are moving the date to May 1 -- May Day -- as many people have asked for additional time to prepare. This letter requests a letter from your state rep to be used in your efforts to present evidence to the state/county grand jury. This letter requests a letter from your state senator to be used in your efforts to present evidence to the state/county grand jury. This letter requests a letter from your U.S. Congressman to be used in your efforts to present evidence to the federal grand jury. This letter is your initial request for the prosecuting attorney to bring charges. Your goal is to establish that the prosecutor ignored your information. This letter is your second attempt to get action from the prosecuting attorney. Your goal is to establish that they ignored your information. This letter is to attempt to influence the receptionist to refrain from interfering with the distribution of your evidence to each grand juror. This letter is to attempt to influence the District Attorney to refrain from interfering with the distribution of your evidence to each grand juror. This letter is to attempt to influence the U.S. Attorney to refrain from interfering with the distribution of your evidence to each grand juror. This is it. This is your two-page letter pitching the Grand Jury to allow you to present your evidence. Assuming you didn't get to see the grand jurors personally to distribute your evidence letters, this is a letter to warn the District Attorney not to interfere with distribution of the evidence. The District Attorney and U.S. Attorney will claim that you do not have the right to present charges to the grand jury directly. This is not true. Any citizen has the right to notify a grand jury of criminal charges. When the DA and/or U.S. Attorney make such a claim, demand in writing that you be shown the statute and case law to support this position. The DA and U.S. Attorney will be unable to do so. Press *67, and call the appropriate office. Call at 12:15 so you get backup receptionists. Don't identify yourself or provide any information if you don't have to. Simply ask: When and where does the grand jury meet? Is there a grand jury inn session now? What days do they meet, and what time do they start each day? Visit the grand jury areas before you do anything else just so you will have the lay of the land for when you or an agent delivers your sealed envelopes. You will need to be able to tell an agent where the grand jury room is, where there is someone posted who may deny access, etc. Casually ask the name of any receptionists or security people. Take notes of everything. 3. Research the state and federal statutes for the crimes that you feel were committed. Note the statutes as you will need to cite them. Identify the specific federal and state statutes that you believe were violated and the names of the people who violated each. Index to each state's statutes. If you missed the February 17 and/or February 24 Lawless America Show, I encourage you to listen to the recordings -- Episodes 100 and 101. Tune in Sunday, March 3, 2013 from 9 pm to midnight Eastern Time for the next TalkShoe show discussing how all of this will be done.